Sift the flour, corn flour, baking powder, cayenne pepper, cumin and paprika into a bowl. Season to taste with salt and freshly ground black pepper. Stir in the carrot, onion, coriander and chilli until well combined. Stir in the water and set aside to rest for 30 minutes. Meanwhile for the cumin and tahini sauce, mix the tahini, yoghurt, cumin, coriander, garlic, and lemon juice and zest until well combined. Heat 1cm/½in vegetable oil in a frying pan over a medium heat. Place large spoonfuls of the fritter mixture into the pan and cook for 3-4 minutes on each side, or until golden-brown all over. Remove and drain on kitchen paper. Set aside in a warm place and repeat the process until all the fritter mixture is used up. 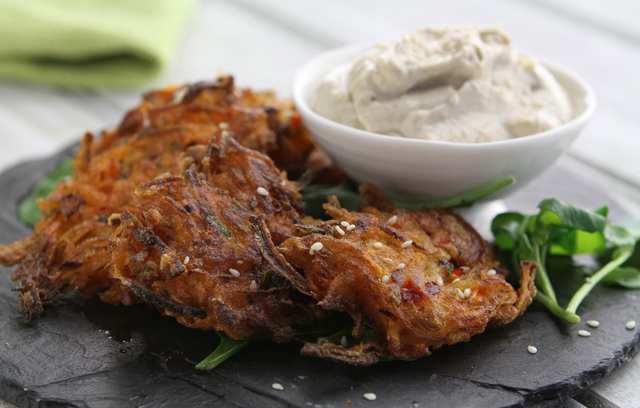 Serve the carrot fritters with the salad leaves, sesame seeds to garnish, and yoghurt sauce alongside. Simon’s Chocolate Orange Éclairs are a deliciously decedent dessert. He has added orange zest and orange liqueur to the traditional chocolate topping for a warming autumnal flavour. These éclairs are perfect for serving as a teatime treat. Choux pastry has a tricky reputation but Simon’s foolproof recipe works every time. For the pastry, place the butter and water in a saucepan and bring to the boil. Once the butter has melted, take the pan off the heat and tip in all the flour and ginger. Beat well with a wooden spoon until the mixture comes away from the sides of the pan. Beat in the eggs one at a time until completely incorporated. Stir in the salt and some of the orange zest. Transfer the mixture to a piping bag and allow to cool for a few minutes. Pipe 6-8 lengths of dough onto a floured baking sheet. The pastry will double in size as it cooks, so give the éclairs plenty of space to expand on the baking sheet. Bake for 30 minutes, or until golden-brown and crispy. Set aside to cool. Whisk the cream, orange zest and vanilla together in a bowl until it forms soft peaks when the whisk is removed. Whisk in the icing sugar and liqueur until well combined. For the topping, melt the dark chocolate with the cream in a bowl over a pan of simmering water. Stir until completely combined then take off the heat and mix in the liqueur. Leave aside to cool slightly. 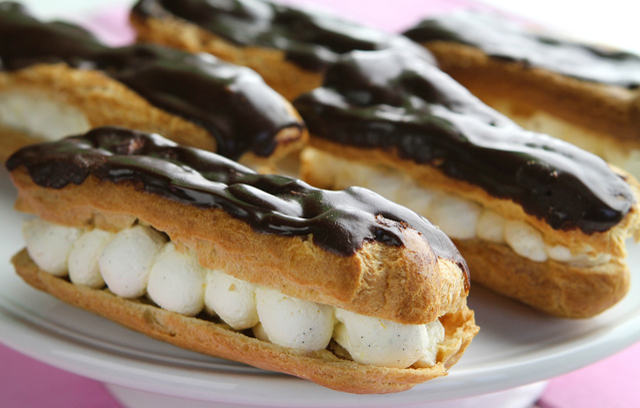 When the sauce has cooled and thickened, spread it on top of the éclairs and serve. As always, go to our Recipes section to find all the Daily Brunch with Ocado recipes so far. This entry was posted in Daily Brunch, Talking Ocado and tagged autumn flavours, Channel 4, Cointreau, Cook, Cooking, cooking from scratch, Daily Brunch with Ocado, eclairs, food, foodie, Fritters, Global Food, good food, Groceries, home cooking, liqueur, Ocado, Ocado deliveries, Ocado groceries, ocado.com, Recipes, shopping, Shopping at Ocado, Simon Rimmer, spice, Tim Lovejoy by Ocado. Bookmark the permalink.